'Darius' (Brown, 1873) DB (original classification dwarf bearded meant under 16" in 1929, This often grows to as high as 18", it is placed here until its proper modern classification can be determined) Midseason to late bloom. Color Code Y3L. Has been described in recent years as "Standards yellow; falls white, reticulated purple, edged primrose; orange beard." The Garden, p. 592, June 24, 1876 "Iris Darius, –This is the name of a singularly beautiful and distinct variety of Iris, in tbe collection at the Exotic Nursery, Tooting. The uprights are yellow, and the falls netted with purplish markings, distinctly edged with yellow. It, like others of the family, may be compared, as regards beauty, to some beautiful and strange Orchid.– Y." The Garden, July 26, 1879 PLATE CXC. IRIS DARIUS AND I. FLORENTINA VAR. Few border flowers are greater favourites than Irises, the majority of which grown in gardens are collectively called German or Bearded Irises, in contrailistinction to the English (Xiphion latifolium) or the Spanish Iris (X. vulgare), which have bulbous root-stocks. Botanically considered, there are comparatively very few of the German Irises derived from the true I. germanica, as there seems but little variation in the colour of their blossoms. The species which appear to have yielded tlie greater number of the varieties are I. lurida, squales, neglecta, sambucina, aphylla, flavescens, and variegata. These are chiefly of tall growth. The dwarfer-growing kinds have probably sprung from I. pumila, lutescens, biflora, Chamaeiris, &c.
A descriptive list of the principal varieties of these will be found at p. 19.5, Vol. VI., of The Garden-. 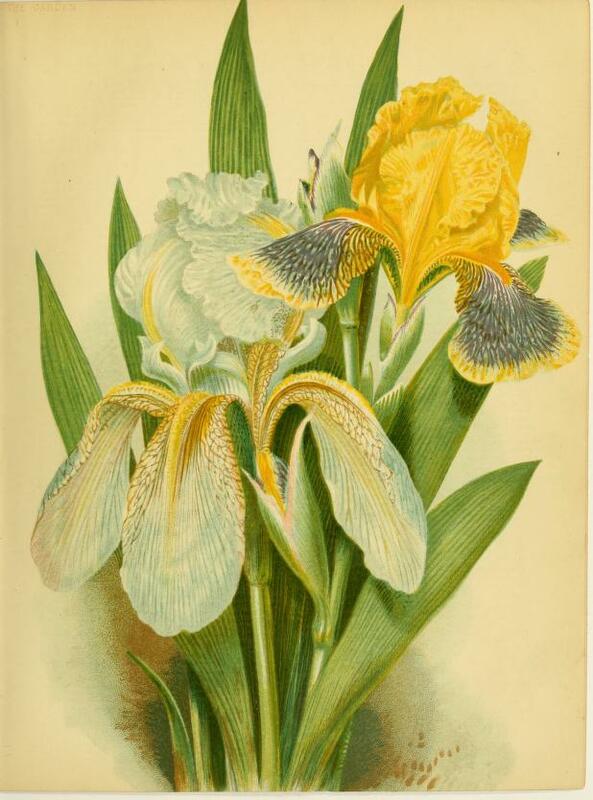 The variety of the Florentine Iris represented in our plate was sent to us by Mr. Ewbank; its blossoms are bluer than the typet-This is nearly related to the new Cashmere Iris (I. cashmeriana), recently named by Mr. Baker, though it is later in flowering and more fragiant. Another section of Iris that has not yet been grown in gardens so extensively as it ought to be consists of the Beardless kinds, which comprise such as I. virginica, versicolor, sibirica, spuria, K;empferi, and many others of rare beauty. The culture of these is of the simplest kind; indeed, they grow well in any ordinarily good garden soil. ' W, G.
Gardeners' Chronicles 14 July 1894, 'Darius' simply mentioned as fine. Article mentions scorch, four and five merous flowers and list other distinctive varieties. Farr notes; "DARIUS. S. rich canary-yellow; F. lilac, margined white, rich orange beard. One of the most distinct and beautiful. 20 in. 25 cts." Freyers 1912 Catalog= "Darius. S rich canary-yellow; F lilac, margined white, rich orange beard. One of the most distinct and beautiful. 20 inches. 30 cts. "